Their 2013 was underwhelming, and could probably be filed as underachieving. Based on roster talent alone, Vancouver probably should have made the playoffs in 2013, just as they did in 2012. But for a variety of reasons, the Whitecaps never quite got it together and missed out on the postseason by three points. As mentioned, the individual talent was certainly there: Brazilian striker Camilo won the Golden Boot by hammering home 22 goals, Nigel Reo-Coker is as powerful a central midfielder as you'll find in MLS, and Russell Teibert flashed the potential of a franchise cornerstone. Truth be told, a lot of issues seemed to stem from the chronic indecision in the franchise, whether it was the front office acquiring goalkeepers like they're penny stocks, or manager Martin Rennie changing tactics as though he was in an Old Navy dressing room. All in all, Vancouver finished above .500 with a positive goal differential, but an awful, late-season stretch saw them win just two of twelve games, surrendering any real hopes of title contention. According to a key off-season personnel decision, Vancouver may believe the main culprit for underachieving was Rennie himself, who was relieved of his duties. Some of his lineup choices often seemed like puzzles for team beat reporters---who were constantly guessing as to who was being shifted to what position---and his apparent inability to see eye-to-eye with talented players like Darren Mattocks can't have helped his chances at keeping the job in 2014. Regardless of the front office's reasoning, Vancouver will return in 2014 with a new coach, and a few key faces missing. Vancouver’s offseason was, in a word, turbulent. First, they swung for the fences in filling their coaching vacancy by approaching former US and Egyptian national team coach Bob Bradley. They struck out on that front, but ‘Caps fans will be hoping they knocked a solid base hit with the appointment of former assistant Carl Robinson. Then, there were a couple of ugly sagas revolving around a few players---chiefly Camilo, last season’s Golden Boot winner. Basically, Mexican club Queretaro came to an agreement for the Brazilian forward to join their club despite the fact that Camilo’s contract with Vancouver was supposed to extend through the 2014 season. The player made it clear that he planned to play in Mexico this year, so eventually a fee was agreed to compensate the Whitecaps, but they still lost their top player from last season. Finally, fans were surprised to find out that draft pick Andre Lewis had apparently already signed a contract to play for the NASL’s New York Cosmos. The team and league both eventually covered themselves by saying that an agreement was already in place for Lewis to play this season in MLS with the ‘Caps, but all in all, a boring offseason this was not. As the 2014 season gets set to begin, Vancouver is one of just a few teams in the league that don’t appear to be as good as last year. Camilo and fullback Lee Young-Pyo are both huge losses, as they were easily two of the club’s best players last season. They did fairly well in replacing Y.P. Lee by trading for Steven Beitashour, who is probably an above-average left back in the league. However, none of this offseason’s other additions appear to have the potential to help replace Camilo’s goal-scoring ability. That said, the Whitecaps still have a good deal of talent on their roster. Even without Camilo, their forwards include former #1 overall draft pick Omar Salgado as well as #2 overall pick Darren Mattocks. Both have had issues staying healthy and on the same page as the coaching staff, but their draft position alone should signal some of their potential. They’ve also got Kenny Miller, a long-time Scottish international who is a very good playmaker in his own right, as well as Kekuta Manneh, another young phenom who was rumored to have interest from super-clubs Chelsea and Arsenal. And that’s just the forwards! In midfield, Nigel Reo-Coker is an absolute beast in the center of the pitch, and it was always a curiosity that he saw time at right back last season. 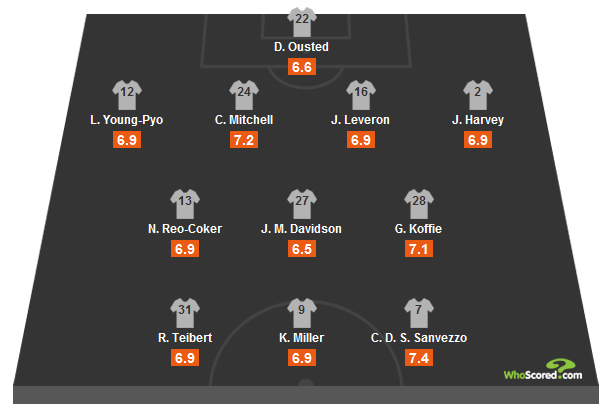 Russell Teibert can provide some fantastic service from out wide, and Gershon Koffie and Matt Watson are both serviceable, at the very least. The defense in 2014 should get a pretty huge boost from captain Jay DeMerit’s return to health – that is, if he can maintain it for a full season. But there are no glaring holes on the backline, as Johnny Leveron and Jordan Harvey both enjoyed quiet breakout seasons last year. There is the slight oddity of Vancouver only having one goalkeeper on the roster as of this writing. I’m sure a second will be added after training camp, but David Ousted had a couple of wobbly moments last season and a trustworthy backup is likely high on the shopping list for Vancouver. Overall, Vancouver's a tough team to figure. Last year they probably should've been better than their record indicated, but is first-time head coach Carl Robinson the right man to help them reach their potential? And as other teams around them got better this offseason, the 'Caps mostly stood around and watched people flee Vancouver. Steven Beitashour seems like he should be an adequate replacement at left back, but by watching guys like Jun-Marques Davidson, Daigo Kobayashi and Camilo walk, Vancouver guaranteed that they’ll be giving a lot of minutes to unproven and inconsistent young players like Gershon Koffie and Darren Mattocks. Again, this roster has the talent to stay in the fight for a playoff berth, but a lot rides on some of that talent finally stepping up and performing this season. In the brutal Western Conference, they’ll need a number of performers to make that leap if they hope to return to the postseason in 2014. 7th place in Western Conference; 89 of 404 voters ranked Vancouver 7th in the West (21.9%), and 307 felt that the Whitecaps would miss the playoffs (76.0%).